Let these industry leaders pay you to own their shares. Buying and holding great dividend stocks is a fantastic way for patient investors to achieve outsize returns over the long run. But not every dividend stock is created equal, and finding the most timely opportunities our market has to offer is easier said than done. Steve Symington (Disney): As the proud owner of not only its namesake parks, products, TV channels, and movie studios, Disney also claims the likes of Marvel, Pixar, and Lucasfilm. But it's about to become even more dominant, with shareholders voting late last month to approve its $71.3 billion acquisition of most of the assets of 21st Century Fox (NASDAQ:FOX)(NASDAQ:FOXA). When that deal closes, probably in early to mid-2019, Disney will add enviable assets to its repertoire, including Marvel's Deadpool, Fantastic Four, and X-Men franchises, TV series including This Is Us, Modern Family, and The Simpsons, networks including National Geographic and FX, and a controlling stake in Hulu. The latter will nicely complement Disney's recently launched ESPN+ streaming service, as well as its plans to introduce a Disney-branded streaming service next year. Couple that with a stock that's trading at a reasonable 16.5 times trailing-12-month earnings and Disney's healthy 1.5% annual dividend, and I think investors who buy ahead of the close of the Fox acquisition will be more than happy with their long-term returns. Sean Williams (AT&T): My favorite dividend stock for August is a well-known telecom giant that's fallen out of favor with Wall Street: AT&T. Shares of AT&T have lost roughly a quarter of their value since March 2017. This weakness stemmed from the company's long and drawn-out attempt to acquire Time Warner, as well as stagnant operating results. In fact, AT&T took a brief hit following the release of its second-quarter results last month that sent its stock to a more than six-year low. But whereas Wall Street sees a stock it would just as soon forget, I see a high-yield bargain. Let's begin with AT&T's second-quarter operating results. Despite revenue that fell short of analysts' expectations, primarily because of an accounting change, AT&T wound up increasing its full-year adjusted EPS to high end of its previous range and boosted its free cash flow, which grew by 46% in the second quarter, to $21 billion for the year, which is also the high end of its prior forecast. If AT&T simply meets these expectations, it's valued at roughly nine times this year's profit projections. Investors are probably also overlooking the advantageous position AT&T is now in with Time Warner as part of its content portfolio. The addition of TBS, CNN, and TNT, along with AT&T's push to roll out a 5G network in the years to come, could be the dangling carrot that lures consumers to its video and streaming services as opposed to its competitors. Lastly, there's AT&T's superior dividend. With its dividend payout totaling less than 40% of its annual operating cash flow, it's not as if AT&T is straining its balance sheet by rewarding shareholders for their patience. This works out a yield of 6.2%, which is roughly three times the average yield of the broad-based S&P 500. There simply isn't a more intriguing dividend stock to buy right now. Reuben Gregg Brewer (General Mills, Inc.): General Mills makes packaged foods, a historically stable, slow-growth business. Lately, however, consumer preferences have been shifting toward fresher and healthier fare. That's put the company, and its peers, on the sale rack as if their businesses can't adjust. But General Mills has been around for more than 100 years. It has adjusted its business before, and it will do so again. For example, General Mills has been expanding Annie's into new segments since it purchased the health-focused brand in 2014. It's working to broaden its dominant position reach in the snack-bar space with legacy names such as Nature Valley and with the additions of Lara Bar and Epic. And most recently, it bought the Blue Buffalo pet-food brand, expanding its reach into the fast-growing natural pet food niche. In short, General Mills isn't sitting still. That said, its Yoplait brand missed the Greek yogurt craze. So General Mills isn't perfect, but no company is. And Blue Buffalo has added notable debt to the balance sheet. So there are reasons to be worried, but I believe these matters will be transitory. Yoplait, for example, is reworking its lineup, and management has stated that it will focus on debt reduction for the next few years. That brings us to the latest headwind to spook investors: rising input costs. Inflation waxes and wanes over time, so this, too, shall pass -- or eventually get passed on to customers. Over the long term, it won't be an issue to worry about. 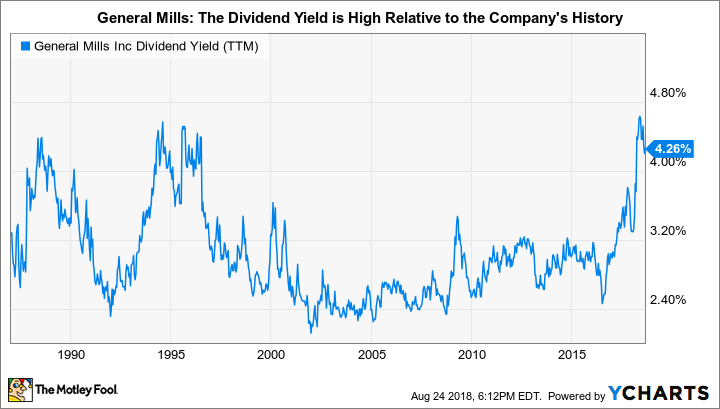 But while short-term investors are fretting about all of these issues, you can pick up an industry titan and collect a huge 4.3% yield while you wait for better days -- which may come sooner than many expect. We can't guarantee that these three high-quality dividend stocks will go on to beat the broader market from here. But between Disney's industry dominance and impending acquisition of Fox, AT&T's depressed share price and juicy dividend, and General Mills' strong long-term potential, we think chances are high that they'll do exactly that, and we believe investors should put their money to work accordingly.